Some of the absolute best fiction books I have read in the past year were the first two books of the Millenium series by Swedish writer Pier Larsson. 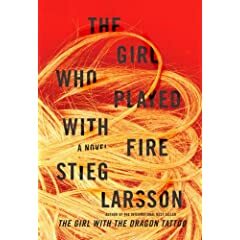 His main character, Lisbeth Salander, is absolutely fascinating and the books have a multi layered complexity that makes for a very interesting read. The first two books are 'The Girl with the Dragon Tattoo" and "The Girl Who Played with Fire". The third one, "The Girl Who Kicked the Hornets' Nest" still has to appear in English. Larsson died in 2004. There are three versions of the movie trailer, with the final one reveal most details.